This is not how Mosier wanted to make national headlines.... with black clouds of smoke and fire; with all eyes on us - distressed, displaced, disgraced people. THIS is how Mosier wanted to make national deadlines.... we revel in our views. THIS is a normal Mosier train day. Kids like Lou are fascinated by trains. We've peacefully coexisted with them for hundreds of years. This is NOT our Rocky Creek park- our Mosier waterfront. At least not on a normal day. Yes, booms are still in place after last weekend's oil train disaster. Oil, please go away. We miss our beach, we miss our trees, we miss our waterfront walks. We miss our salmon. THIS is Mosier's Rocky Creek park - our own Columbia River beachfront where dogs and kids and windsurfers and kiter surfers and SUPers and kayakers play.... and where our salmon brothers and sisters return each year, to spawn in their home town. Dog model Klaus has the classic "I Love You Mosier" smile here. He and we and salmon coexist peacefully; we are Mosierites. There's Klaus's dog mom, Carole Schmidt walking the Mosier waterfront with her grandson Lou and all the usual characters - dogs and kids and their friends - Klaus, Eloise, and my fur kid Doodle. Is this a magical place, or what? Here, my other dog son Dude checks on his fur sister Tia, while we were evacuated last weekend. We got home Sunday afternoon after running for our lives Friday. 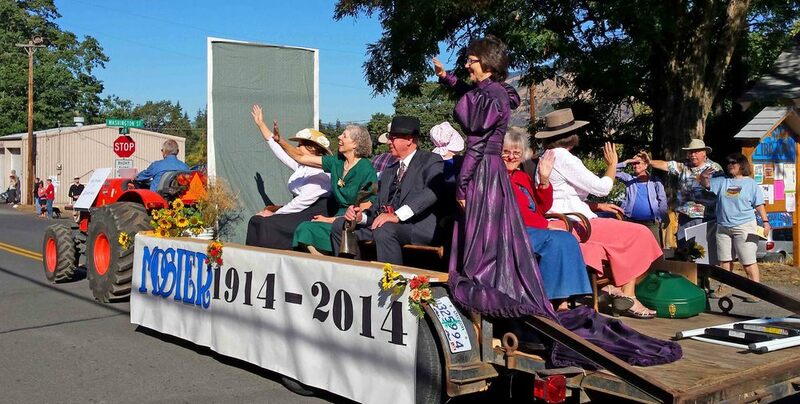 Here's how Mosierites normally show togetherness - this is a scene from our Mosier centennial parade September 2014. We are small, population 430, but we are mighty. We are proud. Here's our fur family in the Mosier 100 parade -- dinky doxie Doodle, basset Elvis, and blind beagle Dude riding our land board with other Mosier locals. It's a big deal, being a tiny town, surviving the best and worse of life for 100 years. Our float carried the plaque of our 1907 farm house. Our Sears Catalog home is rare on the west coast -- shipped to Mosier via the railroad at the turn of the 20th century. That railroad. Our Oregon railroad. Union Pacific. I don't know what we would have done, if we had all lost everything. Right behind our old home is a waterfall park, an overlook trail and a pioneer cemetery. We couldn't wait to see our home again. Here we are evacuating - can you tell? We headed home in the same car, on the same freeway two days later. The fire was out, but we didn't have water or sewer service. Heading home, the stress level couldn't have been any higher. Driving on I-84 toward Mosier had us so clenched up, we could barely breath. What would town look like? The last time we drove I-84, we were running for our lives. As we rolled into Mosier, we saw all the usual signs. Tears rolled down my face. Relief. I looked for this sign over the avalanche of semi trucks and hard hat workers and a cavalry of equipment there, cleaning up the mess. Driving through downtown, we passed the cavalry, the train tracks and then stopped to chat with next door neighbors we last saw fleeing town. There's no place like home. May she live another 109 years. Time for a celebratory nap.